Mataji Deva Vanamali has written seven books on gods of the Hindu pantheon and has translated the Bhagavad Gita. She’s the founder the president of Vanamali Gita Yoga Ashram Trust, which focuses on charitable services to children in Rishikesh in northern India. Vanamali performs an inestimable service to Western readers with her presentations of Hindu myths. Original Vedic texts (the Puranas, Upanishads, and Vedas) may be intimidating, even in translation. Vanamali presents the stories, myths, and lore of major Hindu deities in a wonderfully accessible way. “Shiva” is a roughly chronological collection of stories about the third lord of the Hindu trinity. Brahma rules creation, Vishnu is the sustainer, and Shiva is the destroyer. Transliterated Sanskrit prayers and mantras from the ancient texts with English translations preface each chapter. Greek and Roman myths are good stories but often short on colorful details. Norse myths convey events with epic scope that are expressed in terse poetic forms. By contrast, Hindu myths are opulent in detail and texture – so much so that the original texts can be baffling because of tangential references and narrative asides. Like other mythic pantheons, Hindu gods have distinctive genealogical, marital, and familial connections. 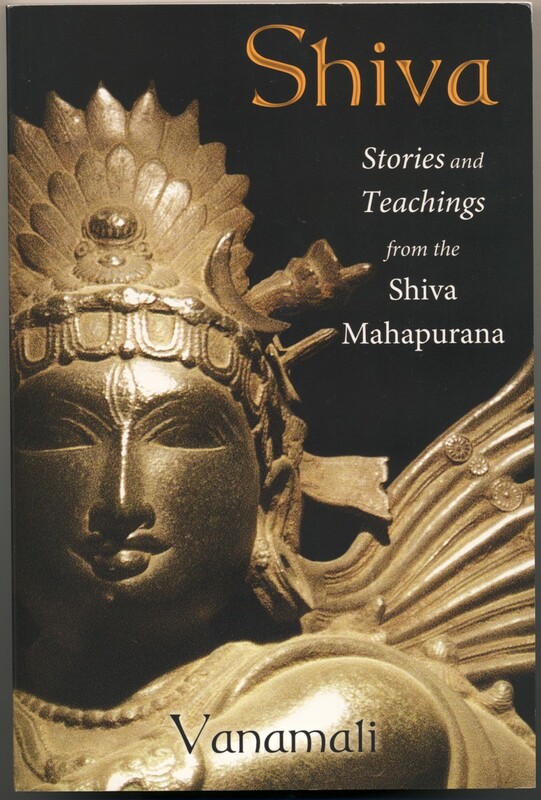 This book accounts for Shiva’s origins, his family relationships, and his wives. Further stories are told about his sons Kartikeya and Ganesha. There are also accounts of Shiva’s battles with the Rakshasa (demonic adversaries of the devas) and a retelling of the famous Churning of the Milky Ocean story. The sacred image of the linga and yoni are explained as well. Part II offers stories about the devotees of Shiva. The lives and acts of particularly memorable devotees are included. Shaivites constitute a large sector of Hinduism, and the locations of notable Shiva temples are described. The end of the book contains five appendices, a glossary of Sanskrit terms, and an index. In the course of her storytelling Vanamali explains the instructive points of the legends, the lessons to be gained, and the reasons why the gods act in such-and-such a manner. For people who haven’t attempted to read Hindu myths, this kind of writing makes the stories more enlightening. For those who have read the original texts, Vanamali’s condensations and transcriptions are gracefully done. Hindu mythology can be a bewildering snarl of names and cross-crossed interrelationships and multiple incarnations and offshoots of particularly important deities. The author makes these clear and easy to understand. Soft polytheists open to welcoming gods from multiple pantheons to their altars may want to acquire this book to get acquainted with Shiva. He’s an unconventional deity! His cosmic dance as Nataraja depicts the mad gyration of energy particles in particle accelerators. As Rudra, he is the principle of dissolution and the husband of Kali. Shiva is known as the auspicious one, but his typical appearance is anything but auspicious. His hair is matted, he’s covered with ashes, wears snakes around his neck and an animal skin loincloth. Shiva has deep connections to an ancient shamanic deity, and appears to be a Johnny-come-lately to the Hindu pantheon. His entourage is populated with ghosts, demons, goblins, wild forest men, and malformed beings. He’s worshipped by wizards, sorcerers, witches, alchemists and magicians. Shiva gets drunk, takes drugs, and can be lawless and wild with his ganas (his entourage), but yet he keeps them in check, too. Shiva hangs out in wild places, remote forests, graveyards and crematoriums, and is associated with people who are unorthodox, casteless, non-conformists, and outside of mainstream society. With so many interesting and even surprising characteristics, Shiva’s stories can be quite a revelation for readers. This is a well-rounded collection of myths and legends about a very eccentric deity. Now that I’ve read this book, I’m eager to read others in this series by Vanamali! This book is highly recommended for readers approaching the Hindu pantheon for the first time; and also a wonderful resource for those who are acquainted with the original texts but would enjoy a coherent condensation of the material for pleasure reading and reference purposes.